When the shy dog crawled up into Betty Meadow’s lap and licked her face, the adoption was clinched. 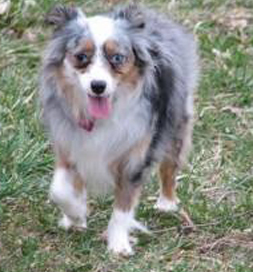 Betty and her friend had driven from Huntington, WV, to Newberry, FL, after reading about the miniature Australian Shepherd on Petfinder. The story was a sad one. When Helping Hands Rescue saved the 4-year-old from a puppy mill, she weighed only 6.7 pounds. Now she was up to 7.8 pounds, but everywhere you touched her, Betty says, you felt bone. Arianna found a loving home far away from where she lived in a puppy mill. At first meeting, the pooch, now named Arianna, went into panic mode, so Betty and the dog retired to a smaller room by themselves. Betty had put the dog in her lap and petted her, calming her down. “I set her down to get some treats from my bag,” Betty says. That’s when the pooch crawled back up and gave Betty a kiss. Once the adoption papers were filled out, they headed north. The ride didn’t start out well. First of all, Arianna had never had on a harness. “I thought she would kill herself in her car seat in the first few minutes,” Betty says. She and her friend quickly decided to put a dog bed on the floor between them in the van and moved her there. That calmed her. On the other hand, she was up on the bed as if she had always been there, Betty adds. “Everything went great until we turned out the lights. Then she freaked. I went back to the car and got the bed and car seat. Eventually she settled down in the car seat to sleep.” They had twelve more hours to go before they would reach home. “I thought we would never make it,” Betty says. But they did, of course, and that was about seven years ago. Today Arianna is happy and healthy. Her puppy mill years are a faint memory, supplanted by a loving home. The power to reach out so far and make a difference for a pooch is the miracle of Petfinder.